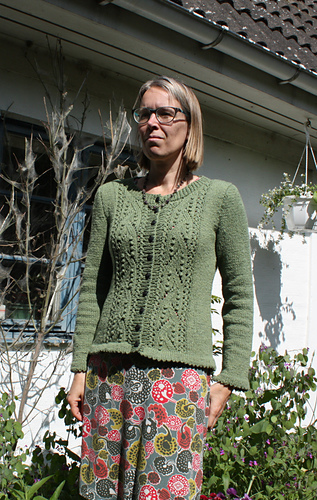 Lente is a cardigan for those in between days. Not that hot, but not cold and wintry either. 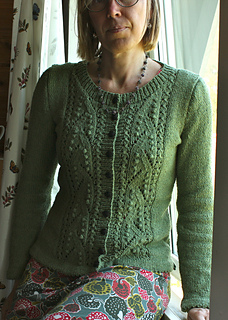 A somewhat rustic silk-cotton mix yarn is used to knit this pattern. 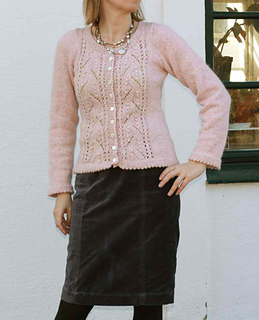 The cardigan is knitted flat, in pieces (back, two fronts and sleeves) and then seamed together. 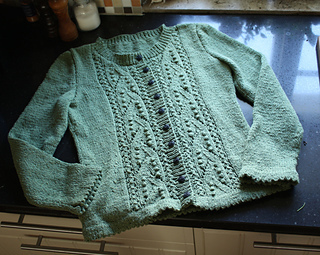 The button and neck bands are picked up and knitted on at the end. Lace panels decorate the fonts. 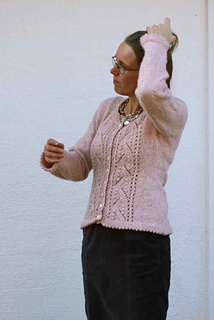 The rest is knitted in stockinette, decreases and increases are used for the waist-shaping which is placed not at the edge but more at the princess lines. A provisional cast-on is used for the hemmed picot-edges, a 3 needle bind-off is used at the shoulder seams. Sizes: 86 (94, 102, 109, 117) cm; 34 (37, 40, 43, 46)” with actual measurement at chest: 88 (96.5, 105, 112, 120) cm, 34.75 (38, 41.5, 44.25, 47.5)“ ; (a schematic picture can be found at the end of the pattern on page 5). Skills: Experience with lace knitting is required. Other Tools: 4 stitch markers, a darning needle, scrap yarn for provisional cast-on, 10 (10, 11, 11, 12) buttons, stitch holders or scrap bits of yarn.